Your satisfaction is our priority. The following list of questions and answers about fiberglass swimming pool will convince you in many respects, and moreover, we are at your disposal all the time. 1. What distinguish DreamPools from other brands on the market? 2. Why do customers choose your products? 3. Why do you offer polyester pools? 4. What does the DreamPools offer include? 5. How can you purchase the DreamPools products? 6. What confirms the quality of the polyester pools Solaris and Sunshine? 7. Why it is worth to mount our pool cover ELEGANCE? 8. How long does the execution of the order last? 9. How much is a transport of DreamPools pools and covers? 10. What do I need in the case of the delivery of the ordered polyester pool? 11. How big should be the excavation for the inground pool? 12. Is it required a concrete screed on the bottom of the excavation? 13. How does the filtration system operates? 14. Where the swimming pool filtration system should be located? 15. Where is the best place to put a heat pump? 16. Is it difficult to maintain the DreamPools pool? 17. What are the of maintenance costs of the DreamPools fiberglass pools? 18. How to prepare a DreamPools pool for the swimming season? 19. How you can protect the DreamPools pool for winter? 20. What should you check out before buying a pool of polyester for installation in the garden? 21. What makes the whole investment, which is the construction of polyester swimming pool in the garden? 22. Why is it worth to build a fiberglass swimming pool in the garden? 23. What is the best location for installing fiberglass swimming pool? 24. What size and shape of garden inground pool is the best? 25. What kind of technology for building swimming pool in the garden should I choose? 26. What additional installations should be used in the pool garden? 27. What are the types of filters? 28. What are the best solutions for heating water and roofing the pool? 29. Is the construction of the garden pool profitable? 30. When is the best time to build a fiberglass swimming pool in the garden? 31. What are the disadvantages and advantages of having a fiberglass swimming pool? 32. How much does the construction and equipment of a fiberglass swimming pool in the garden cost? 33. What are the types of garden pools? First of all, passion and energy. We establish a personal relationship with our customers and build a large, international community, which we help to fulfill the desire of having own oasis and dreamed place on Earth, and this gives us a great satisfaction. DreamPools fiberglass swimming pools, pool covers and accessories are characterized by simple and classic design, the best quality and attractive price. Comfort and true relaxation are more important to us than extravagance. The following elements of the swimming pool reflects this attitude: shape of the pool, steps, accessories and finish. Our products are eye-catching and refined in every way. They give the whole family a lot of joy for many years, that’s why they are willingly recommended. We believe that own, attractive fiberglass swimming pool should be now and in the future, a good affordable to the widest group of people without any loss on durability and quality. Our Solaris and Sunshine pools are nice, with high quality, cheaper and faster to install than concrete pools. You can avoid any cost connected with long-term construction works. We like simple and transparent offers, that’s why we offer you two types of pools: Solaris and Sunshine in several sizes with two types of enclosure: Elegance and Elegance+. We also offer accessories to ensure your fiberglass swimming pool and enclosure a unique look and will keep them clean and fresh for years. 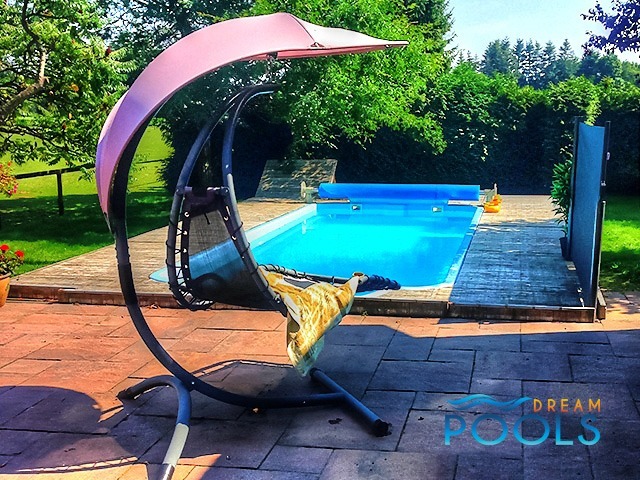 DreamPools products fit the mood of the garden and provide a lot of fun for the whole family, as evidenced by our numerous customers. The key is the contact from you. We check your needs, recomend our products which are tested by our customers. We will give you the opportunity to meet our previous customers and listen about their cooperation with us – confidence. We will prepare a complete and attractive offer with direct transport to your home – a comprehensive service. You confirm the decision with a small advance payment. The rest amount will be paid by you upon receipt of the purchased products. We execute the order efficiently and smooth, remaining with you in constant contact – calmless. After delivery we can give you gladly all the information on installation, assembly, finishing and use of the fiberglass swimming pool. We are very curious about the end result of your investment and we look forward that you will show it off – satisfaction. We are with you in touch and we are very interested in how things are – full satisfaction. Selection of materials and production technology based on years of experience. Additionally, the special polyurethane foam insulation that prevents loss of the heat by water. We use high quality polyester resins and laminates, which are covered with resistant, coated with a resistant gel coat. This coat is resistant to high and low temperatures, the impact of chemical compounds and helps to maintain the pool clean. It also ensures color stability. Uniform construction provides 100% of watertightness. First of all, the swimming season will be extended. Pool cover Elegance ensure the safety and protection from dirt, and the fiberglass swimming pool itself will gain in life-span, nature and attractive appearance. In a covered swimming pool, the algae and the bacteria multiply more slowly, so that you will use less chemicals and detergents to clean the polyester pool. The cover ELEGANCE fits well into surrounding space, and the use of polycarbonate glazing emphasis the quality and appearance of the whole structure. Pool enclosure ELEGANCE is easy to install and thanks to the possibility of installing additional extensions it is extremely functional and does not make it difficult to use the pool. On average, about two weeks. The cost of transport is set individually and depends on the place of delivery, selected by customer. If many fiberglass swimming pools are delivered at the same time, the preferential delivery terms are set. You will require a suitable crane with a reach of at least 10 – 12m to set the fiberglass swimming pool kit. The hooks which are located at the corners of the pool are use to lift the swimming pool by ropes, and than the crane puts the swimming pool kit to the excavation without worrying about any damage. This operation requires the presence of two people besides the crane operator. The excavation should be about 40-50 cm deeper than the fiberglass swimming pool kit. Yes, it is an essential element for setting the swimming pool kit. Reinforced concrete slab with a thickness of 12-15 cm largely impacts on the life-span of the polyester pool, isolates it from the ground and protects against micro-vibrations. The fiberglass pool kit is securely set and the bottom of the excavation of secured from landslide. An essential role is played by the skimmer, through which water is taken from the surface of the fiberglass swimming pool together with the contaminants and transported to the filter. Then the sand bad filters the water and all impurities are removed. Clean and oxygenated water is pumped back through the nozzles into the pool. It should be located near the fiberglass pool. You can apply a ready filtration tank or use any space near a fiberglass swimming pool, for example a cellar. You can also build the engine room, which is placed on the extension of the concrete base slab. No matter what solution you choose, be sure that the operation of the filtration system must be simple and can not cause any trouble. The best is a covered place near the pool with access to fresh air. Simple maintaining of polyester pools Solaris and Sunshine is their big advantage. You can handle with it without losing a lot of time and energy. You only must check the pH two or three times a week and to disinfect and clean the fiberglass swimming pool with a vacuum cleaner once a week. The maintenance costs of the DreamPools polyester pools depend primarily on two factors: first, the method of water treatment, and second the pool cover. In the case of the most popular method of water treatment, i.e. chlorination, the average annual maintainence cost of the pool is about 300-500 Euros. At first, we clean the fiberglass swimming pool – use a vacuum cleaner, net and cleaner for walls. Then we adjust the pH level adding pH plus or pH minus depending on the water quality. pH level in garden pools should be in the range from 7.0 to 7.4. pH level is measured by testers (photometers). Then we pour into the skimmer with activated water circulation a measured portion of clearing agent, in accordance with the instructions to protect water against the growth of algae. Then we pour the correct amount of the protecting agent to a watering can, fill up with water and pour over the entire surface of water in the fiberglass swimming pool. Then, turn on the water and filtering circuit system until the water becomes crystal clear. Remove any contaminations from the bottom of the pool with underwater vacuum cleaner. The last step is disinfection. We use agents with chlorine or an oxygen method. Agents with active oxygen are effective as chlorine, and at the same time are neutral to the skin. After that action, water in the polyester pool is ready for swimming. You should maintain its quality – suitable filtration and measurement of water quality. First, leave the water in the fiberglass swimming pool. The force of frost water in the winter counteracts the force of frozen ground, which press on the pool wall and prevents overfilling in the event of heavy snow. Nozzles in the inground pool are closed, water is pumped out of the filtration and heating system. We also disconnect the pump or remove water below the level of the nozzles. Installation of the pool garden is an investment, that can be safely called a “once in a lifetime”. Therefore, select a pool that will be made of high quality materials, resistant to the very different weather conditions, and that with a little effort will retain its usability for many years (matters of selection of the optimum shape and size will be discussed in another article). It is not a purchase from where you can easily withdraw. Furniture, flat or bicycle You can easily sell when they do not meet our expectations. With fiberglass swimming pool it is much more difficult, so let’s do as much as possible from the very beginning to enjoy our execution, and not regret it. 1) Firstly, the shape and the color of the polyester pool should be rather universal and timeless. 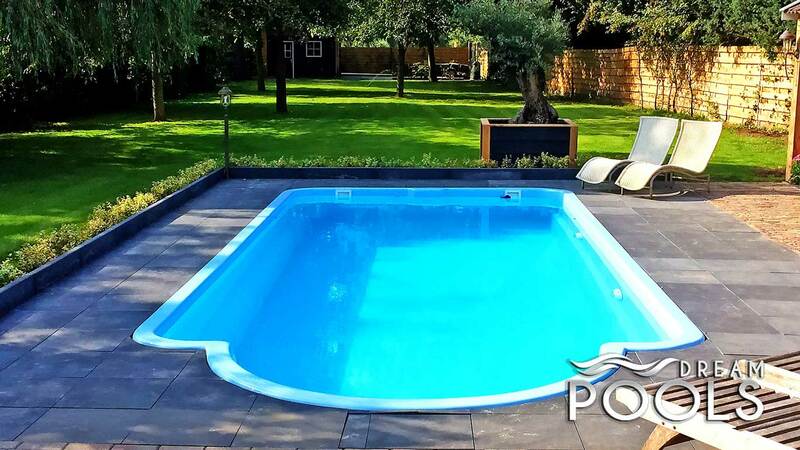 Choose a fiberglass pool in a classic shape, blue or white, because it is a high probability, that in several years we will still be proud of our invest. Every fashion and seasonal hits fade away, and the things simple and classic are always on time. 2) Very important is the production technology of the swimming pool. The fiberglass pools from DreamPools have a special layer of anti-osmosis, which protects the entire structure of the pool from damage that may arise as a result of continuous contact with water (from inside the pool, as well as from the ground). Osmosis protective layer prevents the penetration of water into the pool construction polyester. Many companies ignore the problem and do not use this important layer to make production cheaper. Swimming pools which are devoid of anti-osmosis layer are penetrated by water after a few weeks and their surface is covered by a number of bulges and blisters, which causes permanent damage to the pool. So you should ask before buying the company from which tou want to buy polyester pool for contacts to their clients, who we can ask for the opportunity to see how their fiberglass swimming pools present themselves after a long time of use. 3) The type of material. The standard in our company is the use of high-quality polyester resins and laminates, coated with a durable layer of gel coat. It is resistant to high and low temperatures, the interaction of chemicals and helps to keep the fiberglass swimming pool clean. It also provides exceptional color stability. Five layers of material is a guarantee of lifetime and the perfect appearance for years to come. 4) Additional special insulation polyurethane foam. The layer thickness of 1.5 – 2 cm, which is covered by the pool from the outside, gives a very good security and prevents drop of the water temperature. 5) Stairs. 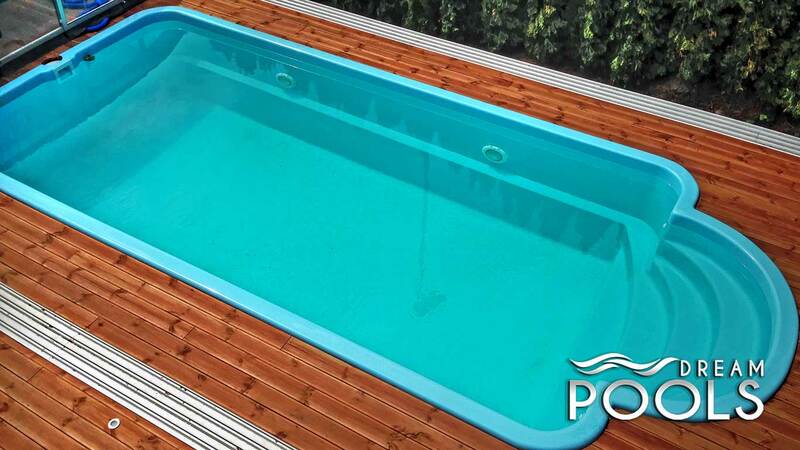 They are an extremely important part of the garden fiberglass pool, because it provides you with convenience, safety and largely responsible for the stability of the fiberglass swimming pool. After many years of testing we obtained optimal parameters, so that getting in and out of the pool as easy as possible and used a special material with a non-slip surface . Checking available on the market polyester pools with such points will allow you to purchase, which you will enjoy for many years. This is essential and very general question that often ask our customers already during the first contact. There are many factors that determine the total investment. However, we want to show what you have to pay attention at the very beginning of operations. We want to make it clear for every potential buyer of fiberglass swimming pool. Certainly it will be a great convenience for many people seeking to build its own swimming pool in the garden. 2) Polyester pools were created in order to provide their owners with maximum comfort, satisfaction and with the least possible involvement. Therefore, take a look at the whole range of options in order to choose for yourselve everything that meets your expectations. Please think about your fiberglass swimming pool invest with a view to using it throughout your life, and not only in the present moment. Unfortunately, many clients resign from long time thinking, and thus the quality, durability and low maintenance costs for the lowest price and the cheapest installer. Filtration: Sand filters, sand filter sets, multiport valves and mirrors, filtration materials. Pumps: Pumps for swimming pools, counter, automatic, submersible pumps. Heating system: heat pumps, accessories for heat pumps, heat exchangers for heat pumps, solar collectors. Installations fittings PVC fittings Flex-Fit, hosetails, adhesives and sealants, hoses. Cleaning the pool: Manual cleaning of the pool brushes, vacuum grid hand, telescopic poles, sponges, algae brush, brush the wall. Automatic pool cleaning: cleaning machines, vacuum cleaners pool. When contacting our company we will be happy to assist you to choose the necessary fittings and listening to your needs will recommend all equipment that will be adequate. The next step is the construction and installers. Installation can be done in-house or enlist the help of a construction company/heating contractor. To swim on hot days, we need not go anywhere. Enough to build a small pool in your garden. Deciding on it, not only gives ourselves relax, but also guarantee peace and intimacy. Contrary to appearances, the construction of a swimming pool in the garden does not have to go beyond our financial capabilities. What’s more, planning polyester pool in the garden often do not need a building permit. There are several key factors that absolutely must be taken into account when building polyester swimming pool. The place should be naturally sunny. It is better to also avoid the proximity of trees and shrubs. In addition, you need to check bearing capacity and the level of groundwater. It is worth remembering that in the construction site did not follow any plants or roots. Defining the parameters for the fiberglass swimming pool we have to draw attention to the fact that they will be bigger, the more expensive it turns out its operation. If you want only to have a bath with your family enough is pool about 5-6 m long and 3m wide. But if you want to swim, you should choose a pool of 8-10 m long and 3,5-4 m wide. Low comfort can also cause an irregular shape that is difficult swimming or covering, therefore, best suited for classic shapes. The standard depth is about 1,5 meter garden pools. Remember, too, that the pool can be built in the earth, or set directly on the ground. In the case of high groundwater levels it is recommended the second option. – brick structure with blocks. It is becoming increasingly popular to install ready-basins of polyester with extra insulation. This construction is extremely durable and visually attractive. The ease and speed of installation and finishing and the purchase price make polyester garden pools have revolutionized the industry. Own swimming pool is now at fingertips for a wide range of clients. To maintain clean water in the pool, specialized installations are necessary to ensure its movement. On the market there are ready-made systems, which consist of: skimmers, gutters overflow, pumps, filters, nozzles and outgoing bottom. Let’s remember to always choose them individually to the size of the pool. We desperately need to also equip swimming pool filters, since the parameters of water in the pool should be similar to those of drinking water! It should also obtain a basic set of cleaning the pool, which is manual or mechanical vacuum cleaner and the grid for recovering pollutants. Mechanical – mostly gravel, sand or anthracite, very often they equipped with devices specifying the degree of water pollution. Chemical – help to maintain the pH 7.2-7.6, which is optimal for both human skin and for metal equipment incorporated in the equipment pool. Disinfection – contains chlorine or other compounds (ozone, bromine, iodine, oxygen activated). Often, due to its geographical location, thermal insulation alone is not enough to prevent heat loss. To be able to as long as possible to enjoy a period of bathing, you will need to installation of heating equipment. The choice of installation depends on the size of the fiberglass swimming pool, any possibility of roofing and water temperature you want to maintain. Among the most popular ways of heating are oil or gas boiler, electric heaters or solar collectors, heat pumps. Inexpensive and frequently used solution to the boiler is connected to the heat exchanger. Another solution is to also join the heating of the house to heat water in the pool. In this case significantly decrease installation costs. The best solution for fiberglass pools are heat pumps and pool enclosures. If we remember to cover the pool at night is effective not only will reduce heating costs, but water loss due to evaporation. Typically used for covering budget foil solar fabric or PVC blinds. Importantly, the latter are very durable and safe, because after such cover can move even an adult. 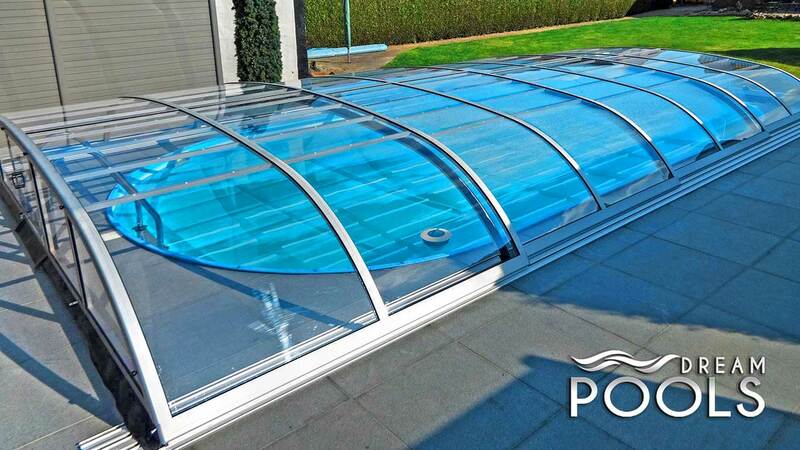 The best solution in our opinion is pool enclosure of polycarbonate and aluminium. It’s very functional and looks perfect. Thanks to modern technology garden swimming pool is no longer a luxury. 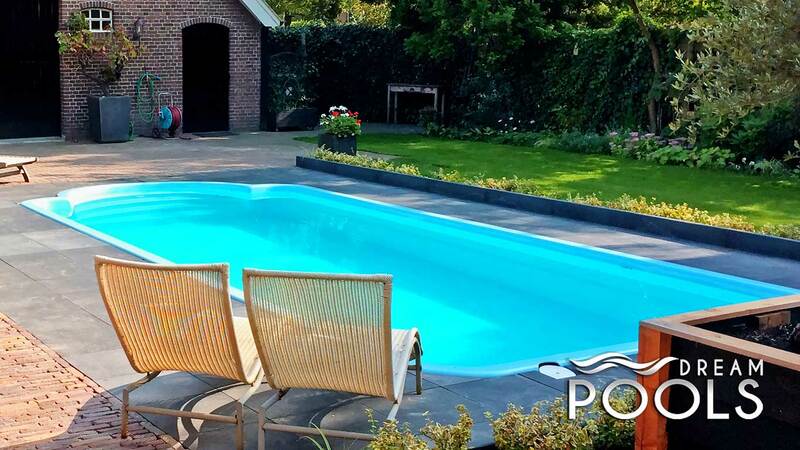 Ready pools, with an additional insulation allow us to enjoy its own quite big swimming pool without involving huge financial resources and a lot of time and energy. There are also great ways for it to even in temperate climates to be able to use the pool most of the year. These are systems for heating water and pool covers, which not only protect the pool, but add to the charm and change our garden in an unusual place. If you dream about happy moments spent with family and friends in your own garden, a garden pool construction is the ideal solution. Buying swimming pool made of polyester meet your dreams while saving money, time and energy. Well, if the pool garden created simultaneously with the construction of the house – a lot of work you will be able to perform the same hardware (for example, delivery of material excavation) – and upstream of the area around the building and the foundation of the garden. With this order works costs will be lower than if the pool garden was the last investment. But the great strength of polyester swimming pools is that they can be installed at any time without having to rebuild the entire garden. •	endless opportunities to arrange and trim, it can build in the terrace, put in the garden and so on. •	systematic removal of contaminants from water (falling leaves, growing algae). The solution is to use roofing basine, pool enclosure low or high or blinds or roll of solar foil. Pool basin made of polyester with additional insulation with the primary filtration system and manual loading of disinfectants depending on the size of the costs of several thousand euros. To heat the water in the polyester pool can be used heat pumps, heat exchangers or the solar system, with prices ranging from a few hundred to a few thousand euros. Stairs provide safe entry to the pool. Additionally, you can install the ladder. You will have to spend on it – depending on the model and size – from a few dozen to a few hundred euros. To protect fiberglass pool from dirt useful is foil, blinds or tarpaulin or roofing, which is by far the most convenient and durable solution. Its cost will depend on the size of the cover, the material from which it is made, and winding system. It will be inevitable even without brushes hand in cleaning the pool or a vacuum cleaner, which will have to spend tens of euro for brushes, a few hundred euros for the cleaner pool. If our pool budgets are still some free agents, we can devote to generating device counterflow, slide the device for massage. Thus equipped garden fiberglass swimming pool can beautifully illuminate, which adds to the charm. There are several types of garden pools, swimming pools built traditionally blown, ready to be placed in the basin. Inflatable pools are the cheapest. Does not require the appointment of a permanent place in the garden or taking any work. They are made of a thin but durable rubber. You can access them even pour a few cubic meters of water, without fear of cracking walls. Eagerly bought by landowners. After the end of the season can release water from them, roll up and store in a drawer. They are often chosen for small children. Their disadvantage is low durability, easily damaged, dirty and destroy. Often these are pools for one season. Pools anchors are easy to install. Often they are made from durable materials, glued several layers. Pools rack, it’s very often, much larger structures than the pools anchors. Due to its design provides a much larger surface of the water than in the case of swimming strut. But keep in mind that the pools rack are not made of rubber, which can be dangerous for small children. When purchasing pool rack must also bear in mind that its price will be higher than the pool strut. In return, we get a lot more space for fun and relaxation. Pools rack characterized by a much greater strength. The downside pools rack is that it does not look attractive and often spoil us the charm of the whole garden. Much more expensive is the construction of a swimming pool traditional – with reinforced concrete. Walled basin taught in ceramic tiles or special film of PVC. It is covered with acrylic coating, which enhances its resistance to extreme temperatures, UV radiation and chemicals. This film guarantees perfect sealing basin. Such a pool for hygienic reasons require filters and pumps, as well as the use of funds for water treatment. When it is open – the winter has to be partially emptied and covered. If you dream of a private swimming but discourages long construction of a swimming pool, the ideal solution is to buy a ready pool garden. Pools of polyester, as the name suggests, is made from glass fiber reinforced polyester, thermally hardened. This material is very durable, durable and quite flexible, and resistant to UV radiation and extreme temperatures. This pool has a multilayer structure, reinforced with polyurethane foam, which guarantees its rigidity and prevents cooling down the water. These pools are also usually formed stairs and seating. The surface of many models may even have a few dozen m2, making it suitable also for free swimming. They can be build over the surface of the ground, or put in a specially dug basin. On the market there are also swimming pools, the design of which constitute the panels of galvanized steel (thickness 0.6-0.8 mm) or plastic. They are covered with plastic on the outside and on the inside – protective varnish. They have a very different forms – they can be round, oval, eight. Their interior is covered with PVC film in one of several colors (eg. blue, turquoise), resistant to UV radiation. These tanks can be up to 10 m and a depth of 1.5 m. After placing a swimming pool set on a prepared surface, it can also be placed in the trench. Before that, however, must be introduced into the bottom of a concrete slab thickness of 15-16 cm. Construction of the pool of this type is a specialized task team. Necessary accessories swimming are the water purification filters. It is also worth thinking about enhancing additives bathing comfort – whether steps trampolines and lights.